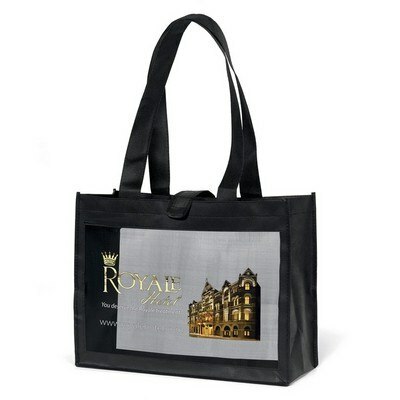 This custom logo Royale shopping bag - four-color process is made from 100 GSM non-woven polypropylene. Feel like royalty and add an extra touch of class and elegance to your overall appearance when you carry the Royale shopping bag - four-color process with you, to your closest grocery store or hyper mall. This black bag is made with 100 GSM non-woven polypropylene. It has front and back mesh panels for you to separate the items you buy plus to hold essentials like cellphones, keys, and other small necessities. The two inch wide and twenty eight inch long handles make it easy and comfortable to carry. The wide Velcro strap closure ensures that your shopping items remain safe and secure without spilling over. Use the four-color process to print your company’s logo on the mesh panels and create a regal impression of your brand.